The daily round of prayers recited by monks (divine office) drew upon a number of different kinds of books: the psalter, Bible, hymnal, and collections of stories of saints' lives. The latter contained accounts of the deeds of the saints that marked them holy people. Excerpts from a saint's life might be read as part of the office on his or her feast day. 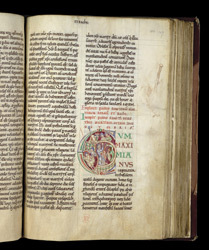 Made in the early 12th century for the monastery of St Augustine, Canterbury, this English martyrology or passional has decorated initials--rare among martyrologies of its time--some with ingeniously designed decoration telling a saint's story. The feast of St Demetrius is commemorated with his life that had been translated into Latin from Greek by the 9th-century papal librarian, Athanasius. The initial's decoration tells the story of his martyrdom, pivoting around the figure of Emperor Maximianus, who raises his hand in a speaking gesture. At the top, Demetrius, a Christian, is arrested. The circular frame in the centre represents the stadium where Maximianus watches his sport idol Lyaeus the gladiator being killed by Nestor, a 98-pound weakling who volunteered from the stands. Finally, Demetrius, lying captive in a public bath under the stadium, is killed at the whim of Maximianus, in a bad mood because of what happened at the match.